A vigorous rally outside Imperial Metals’ AGM on 29 May brought the message loud and clear to the company’s shareholders: People do not want a mine in Clayoquot Sound. With speakers from Ahousat First Nation, Neskonlith Secwepmce First Nation, Wilderness Committee, FOCS and Clayoquot Action made strong points against mining in a UNESCO Biosphere Reserve and on unceded native territory. FOCS board member Eileen Floody read a statement to shareholders to the crowd on the sidewalk, then as a shareholder herself (one share!) took it inside to the AGM. Today Friends of Clayoquot Sound, the Wilderness Committee, Clayoquot Action, and representatives from both the Ahousaht and Tla-o-qui-aht First Nations held a rally in front of Imperial Metals’ Annual General Meeting. Imperial Metals owns two mineral properties in Clayoquot Sound, a UNESCO Biosphere Reserve and the largest intact stretch of old growth coastal temperate rainforest on Vancouver Island. One mineral property, on Catface or “Chitapi” mountain, lies at the heart of the Sound. The other, the site of the old Fandora gold mine, lies at the head of the Tranquil Creek watershed. 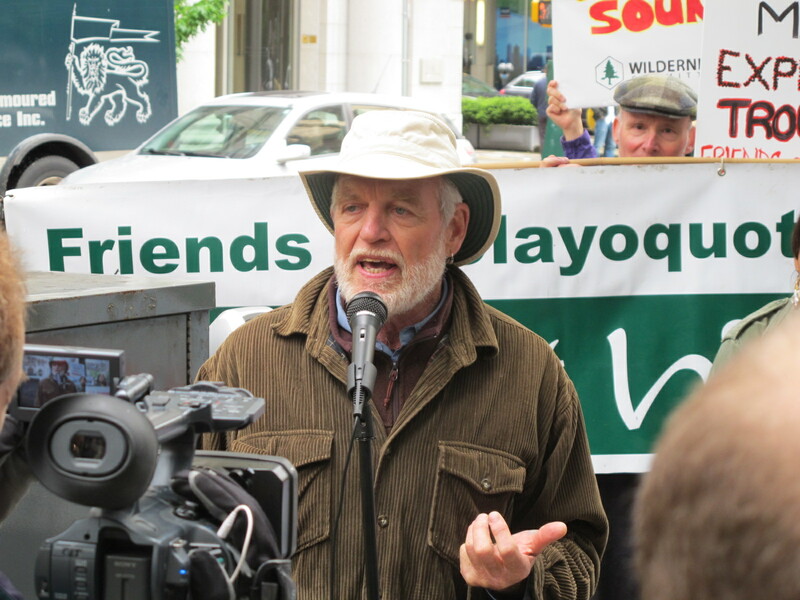 Friends of Clayoquot Sound has been fighting for the preservation of this area since its inception in 1979 and today takes that fight to Imperial Metals and majority shareholder Murray Edwards. Murray Edwards is one of Canada’s wealthiest businessmen and is part owner of many Canadian enterprises including the Calgary Flames and Resorts of the Canadian Rockies. 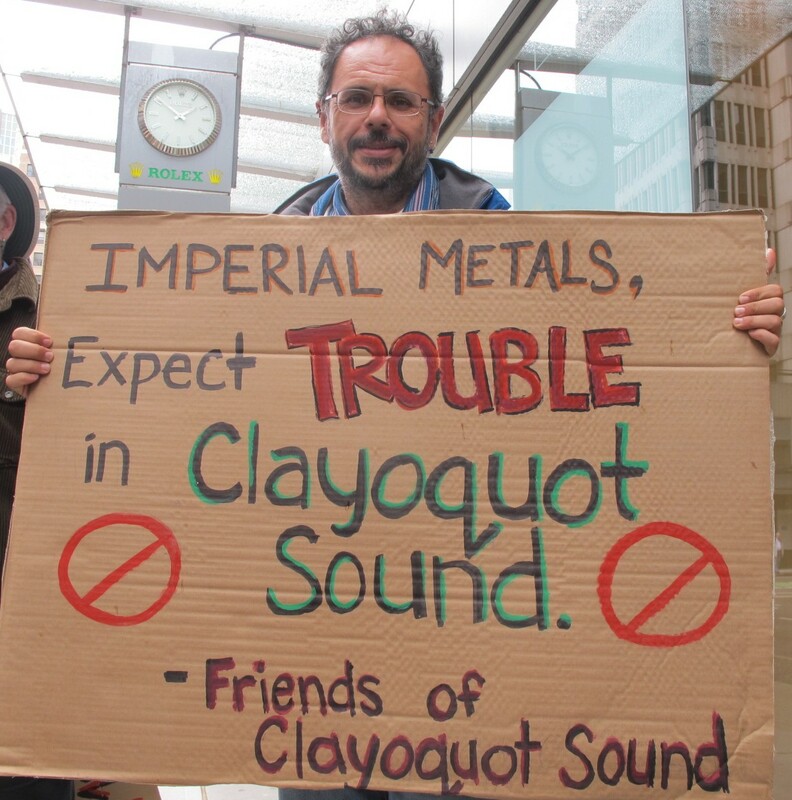 The challenge launched by Friends of Clayoquot Sound today is that they WILL hold Murray Edwards and his kingdom accountable for Imperial Metals’ actions in Clayoquot Sound. While the rally was held outside the Terminal City Club, Friends of Clayoquot Sound member Eileen Floody was able to read a joint statement from Friends and the Tla-o-qui-aht First Nation inside the AGM. The statement iterated the firm opposition of the Tla-o-qui-aht against any mining in their territory. It also reminded Imperial Metals that Clayoquot Sound has been a hot-bed of political controversy in the past and the people will not stand idly by while mountain tops are blasted away and tailings ponds are built over productive salmon streams.